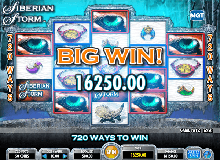 Enjoy the icy and cool climate from the exotic online slot game by Betsoft developers. 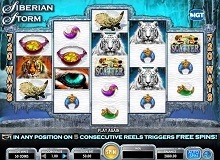 The awards of tribal relics and roars of tigers from Siberia will entertain you when playing Siberian Storm slot online. This game is highly volatile, and it is not for the faint-hearted. The player will have to work quite hard to get the huge rewards provided. One needs to have a great bankroll and understanding of the rules to earn the prizes. The modern and unique slot is designed with 720 ways to win and 5 reels. The high pays and innovative features have helped to increase the game’s popularity in the industry. The slot is available at both online and land-based casinos. The game starts as soon as you place your first wager. If you play Siberian Storm for real money, start by choosing the coin value. The total stake of the player will be equivalent to 50x the bet. Hit the ‘Spin’ button to turn the reels. One can use the auto spin button to play up to 50 spins continuously. The game features a huge coin value range which begins with a minimum of €0.01 to a maximum €3. The coins are fixed to 50, and thus the betting per spin ranges from €0.50 to €150. It, therefore, caters for both high and low rollers. It has an RTP of 96%. 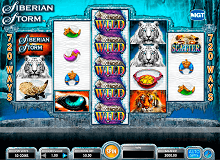 You will come across several icons when playing Siberian Storm slot machine online and they all pay differently. The player needs to match symbols starting from any side to form a rewarding combination. All the symbols can appear stacked during the gameplay which increases the possibility of huge payouts throughout the base game. The games Logo is the highest paying icon. 3, 4 and 5 of these icons pay 50, 150 and 1000 times the original bet. Other symbols with high values are the two distinct tigers. Other icons offering lower payouts are a tiger’s tooth and jewels. The maximum prize offered to players in this slot is €25,000,000. Special IconsThis game has a wild, scatter and bonus icon as its special symbols. These icons can also appear stacked on the reels increasing the payout. Wild Logo- The symbol with a purple background, a white tiger and the name ‘Wild’ on it is the wild icon. This icon will only appear on the second, third and fourth reel. It will replace all the games symbols except the bonus and scatter icon. Scatter Symbol- The icon with the word ‘Scatter’ on it is the games scatter symbol. The scatter pays regardless of where it is on the reels. Scatter payouts are multiplied with the total Bet. Three, four and five scatter icons pay 2, 10 and 50 times the total stake. Green Eye Symbol- This represents the bonus symbol. The bonus icon plays the role of triggering the free spins feature. Multi-way Xtra AwardThis is one feature that appeals players to play Siberian casino slot online. The player is active both during the base and bonus games. Wins in the slot are paid in both ways which are from left to right and right to left. The symbols, however, must be on adjacent reels. A multiplier is awarded if icons appear on the same column. Free SpinsThe player needs to line up 5 green eye icons on consecutive reels to get 8 free spins. One will be rewarded with an additional set of free games when they get more than one combinations of 5 green eye symbols. There is also an orange eye that appears only during the bonus round. It also rewards 8 extra spins. 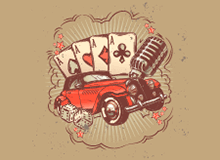 The player can get as much as 240 free spins during the bonus feature. Progressive JackpotThis slot has a mega jackpot version. To win the maximum prize, the player is required to show 5 Mega Jackpot icons on the payline at the centre, both during the bonus and base game. A second chance can also be triggered randomly behind the scenes on a non-winning spin.Play Siberian Storm for free at online casinos with your mobile device or desktop. The high-quality audio and graphics, exceptional features, interesting plot, and cute theme make the game more enticing. It offers plenty of chances to stack up to the huge wins. Ensure that you keep a close look to your bankroll as you play to avoid gambling all your money.